Today on 5-Day Artist Challenge, I bring you DRAMA. 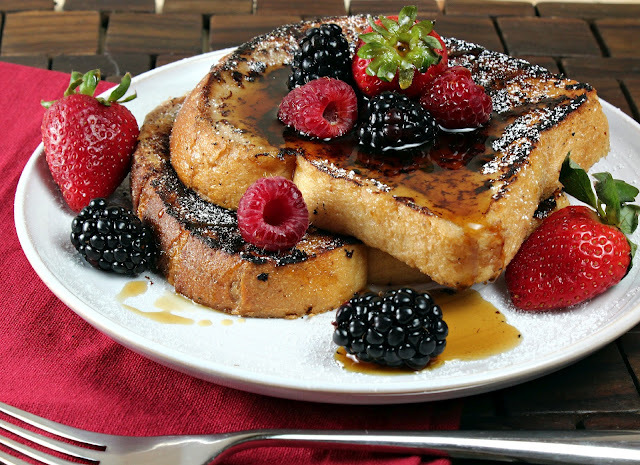 If art is bread for the soul, I’m gonna say that drama is… French toast. You take some words/bread that someone else made a while ago, and make it your own. You give it new life with your own egg/milk mixture of interpretation. It might, in the end, look completely different from how it looked before you renewed it, but in essence, it is the same. Dramatic French Toast via generationyfoodie.com. I love drama in many ways. Not in my life, particularly, but to witness, as a discipline. I have a lot of respect for good acting, both cinematic and theatrical. And I am thrilled by high-quality improvisation. I’m not particularly talented at it, myself. (My sister Emily and my mom are both really good actors, so I know what that looks like.) Of course, I was in many a Christmas play as a child in Quaker Meeting. I once starred as the Robin in a play I believe was called “Robin Saves Christmas.” All I recall was that I played the piano at the end of the presentation (to represent church bells) and then accidentally put my wings on upside-down to deliver my last line. At age thirteen or fourteen, I also played half of Della in The Gift of the Magi – that is, Della before her hair is cut short. I’m on the left, all verklempt because I have no money for my beloved’s Christmas present. The kids in our family all participated in the Kiwanis Festival, and I did many poetry recitations and Shakespearean scenes. I can remember being told on more than one occasion that my voice was too soft, I needed to project more. Also as a young teen, I came to understand the power of a dramatic performance to move an audience to tears and/or goosebumps when the drama club at Intermediate Camp put on a self-created series of sketches about gender stereotypes. 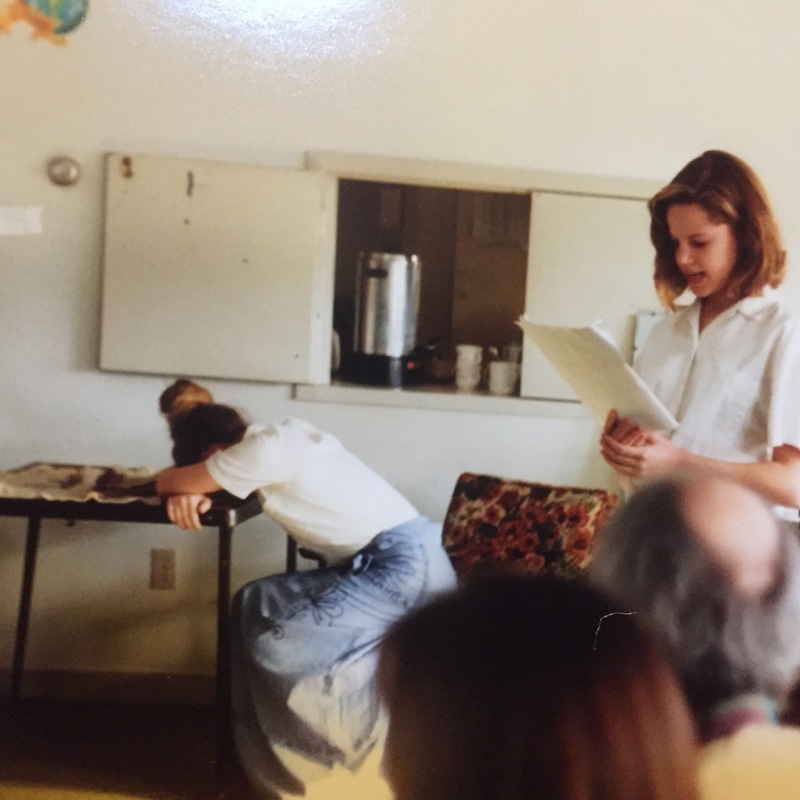 I fervently wished I’d been part of it – I’d always been in the drama club before, when all we did was play games, but this… It was drama to make an impression, make a difference. I was briefly part of the drama club in high school, but I was not in any of the musicals. I was kinda sad about that, but I was also already an overcommitted teenager (by choice). In my third year of university, I played “Charlotte” in Du poil aux pattes comme les CWACs for a Québecois lit course. I think I was pretty bad. I know I could never manage to convince even myself that my crying was real when I got the news that my boyfriend had been Killed in Action. But I did drop to my knees with such commitment that one of them bled, so that must count for something. Nowadays, my dramatic skills are mostly used for dancing (MOTL), teaching the AIM program in Core French, and reading stories to my kids. As a narrator, I’m no Morgan Freeman, but I can say that the more I like the story, the better my acting. And as a teacher – you can bet I’ve learned to project. My kids, on the other hand, are great at bringing lots of drama into our everyday lives. I never have to worry that life will be too humdrum. Great post! I like your metaphor. I think you’ve forgotten some of your starring roles in First Day School plays. Weren’t you also half of the lead in “Christmas in the Market Place”? And what about “Why the Chimes Rang”? And “Teach Me to Dance”? I don’t think I knew about the role in the French play at university. Did you keep it a secret from us? Looking forward to the next 3 days…! You’re right! I was forgetting about Teach Me To Dance. I only vaguely remember the first two you mention, too… Are you sure I had an important role?